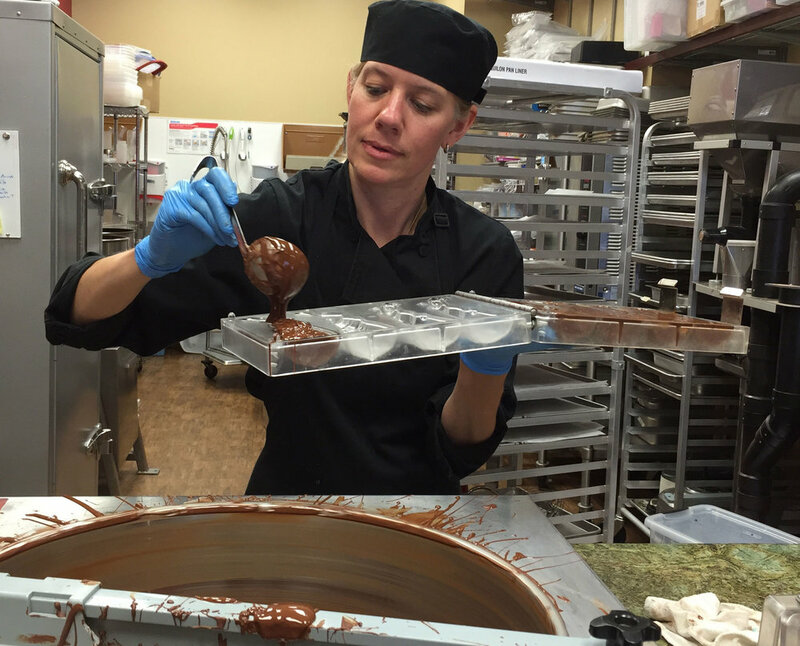 Denise Castronovo is the quiet champion of bean-to-bar chocolate. You may not have ever seen her demure bars or even heard of her tiny operation, Castronovo Chocolate, out of Stuart, Florida, and Denise certainly doesn’t announce herself when she walks in a room of chocolate makers: The blonde fortysomething is somehow camouflaged by her modesty. Yet she has won a spate of awards for her exquisite chocolate made with heirloom cacao, and Castronovo is actually the only woman-owned bean-to-bar company in the U.S. to have won an award from the International Chocolate Awards. Eventually Denise presented her work to the city, and Wangari Maathai, an environmental political activist and the first woman to win a Nobel Peace Prize, was in the audience. Maathai was known reforesting areas of Kenya, and when she saw the technology that Denise and her team were using to document progress, she stood up and took notice. Maathai consulted with Denise and eventually implemented a similar system in her own organization. Around 2008, though, as the economy slowed down, so did Denise’s consulting business. Then serendipity hit. She bought some cocoa nibs from Whole Foods and realized for the first time where chocolate comes from. “I started researching chocolate and found out that it had all these different flavor notes,” she said. “Single-origin chocolate was starting to be a trend and I was like, “Wow, this is incredible.’” Of course, it was all theoretical to Denise: In small-town Florida, she didn’t have access to any of this type of chocolate, and she didn’t even try any other bean-to-bar chocolate until six months after she started making her own, in 2013. Shortly after she started to make chocolate, Denise’s husband signed her up for the farmers’ market; people loved it, and two years later, they opened a tiny, 725-foot storefront in Stuart. Four people work at Castronovo (including Denise’s husband), turning out small batches of chocolate using a convection oven and two melangeurs. Visit her store and in addition to bars you’ll find treats like truffles, hot chocolate, and chocolate chip cookies on Thursdays and Fridays at lunchtime (get there early or pay the consequences). As a nod back to her first career, she chooses to work with heirloom varieties of cocoa beans from the rainforest to help protect those habitats. Take her Honduras bar. “The beans come from an area that is the largest area of virgin rain forest in all of Central America,” she explained. There’s not a plantation; indigenous peoples forage for the beans in the forest, ferment and dry beans in an onsite facility (equipped with solar panels! ), and then transport them up river in a canoe. When Denise gets the beans, she carefully roasts, grinds, and smooths them into chocolate. Her dark bars are fantastic, but she’s most proud of her dark milk chocolate. Dark milk?! Yes, I know, for most of us these are mutually exclusive categories. But they don’t have to be. Chocolate makers have started creating milk chocolates with a high percentage of cocoa. (For example, Denise’s bars are around 60 percent, much higher than most milks you’ll find.) They use top-notch ingredients just like in their single-origin chocolates, bringing the same integrity to a category once considered kid stuff. “Dark milk rounds out the flavors of the cocoa bean,” Denise explained. Now she has three more dark milks in the works and a signature series of bars coming soon. She told me that at first she didn’t think the dark milks were “complex in flavor” but quickly realized otherwise, first with her Sierra Nevada chocolate. Thank goodness, because that bar has won eight awards, including a gold metal in the International Chocolate Awards World Finals in 2016. That makes a total of 26 awards from several different competitions for Castronovo. Sign up to get choco-riffic stories delivered directly to your inbox!